If our Rhino’s don’t have a future, what will ours be? 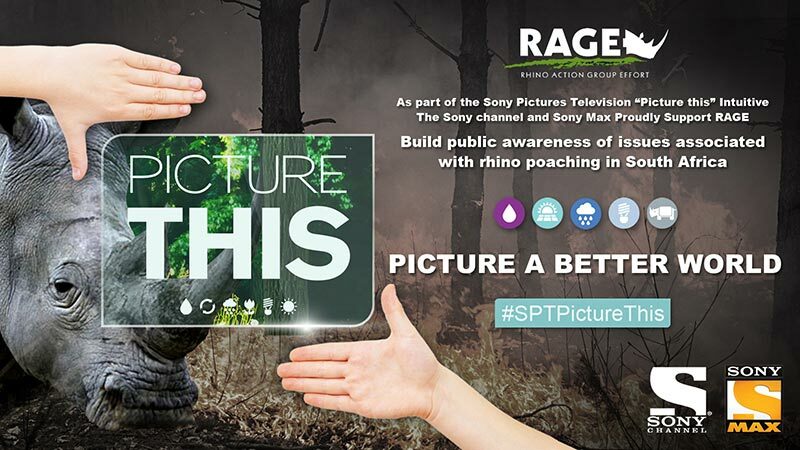 Sony Pictures Television Networks recently launched a worldwide campaign to promote awareness of environmental issues, titled Picture This. Launched in September 2015 and running across all their channels globally, Picture This will leverage the TV channels’ storytelling expertise to engage viewers around environmental issues important to each of their territories markets. In South Africa, Picture This will be promoting initiatives to save the rhino on both the Sony Channel (DStv Channel 127) and Sony Max (DStv Channel 128). Working in conjunction with RAGE (Rhino Action Group Effort), a LeadSA (a Prime Broadcasting and Independent Newspapers initiative) to assist in the fight against the illegal rhino poaching scourge. RAGE was designed to be a safe conduit for public contributions to the cause whether they be financial, material or in the form of skills and information. When donations are received, RAGE’s committee of volunteer experts (ecologists, game reserve owners, members of government, media professionals, economists etc) collectively decide where they can best be utilised to make a difference. Picture This initiatives in other territories include: recycling in Russia; eliminating plastic bag use in Asia; waste disposal in Italy and India; urban gardening in Latin America; and deforestation in Romania. According to rhinorage.org, three rhino’s are poached every 24 hours. Since 2010, over 1215 rhino’s have been lost to poaching. If the killing continues at its current rate, rhino deaths will overtake births from 2016-2018, meaning rhinos could go extinct in the very near future.